In July 2013, the Rookery was 100 years old. The Friends of Streatham Common, along with Lambeth Council and the Streatham Society, planned various improvements in and an event to mark it. * Streatham Society published a book on the history of the Rookery and Norwood Grove. Did you know that In 1921, the Princess Royal chose a painting of the Rookery for her official Christmas card, that it was laid out as an old English garden with a White Garden which pre dates Sissinghurst by twenty years? Did you know that they used to grow flowers from seed on site? Did you know that the (well it is obvious is it not) London County Council designed this as a country idyll in the city and that when it opened there was no opening ceremony? 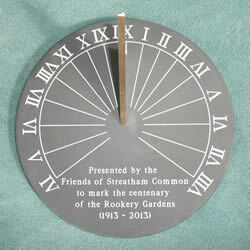 The 23rd July 2013 saw the gardens of The Rookery reach its 100th year as the beautiful public space that serves the local residents of Streatham. On the exact centenary, an event was held to honour both the occasion and the man who made the Rookery’s existence possible: Stenton Covington. Watch the Centenary Event Video here.